I want to control flow level on 12V water pump with PWM pin, I'm using IRF520N MOSFET for that (and dedicated 12V power supply). I'm assuming, that setting PWM to full byte should give me about 100% or 12V. But how to set proper value on PWM pin so the flow equals to eg. 10%, 25% or 50%? Is it some logharitmic equation? Expanding on dannyf's answer, if the pump datasheet does not feature a graph, then you will have to experiment. If a flowmeter is not readily available, an excellent approximation can be calculated by pumping water into a large, known receptacle (e.g. 10 litre bucket) and timing how long it takes. 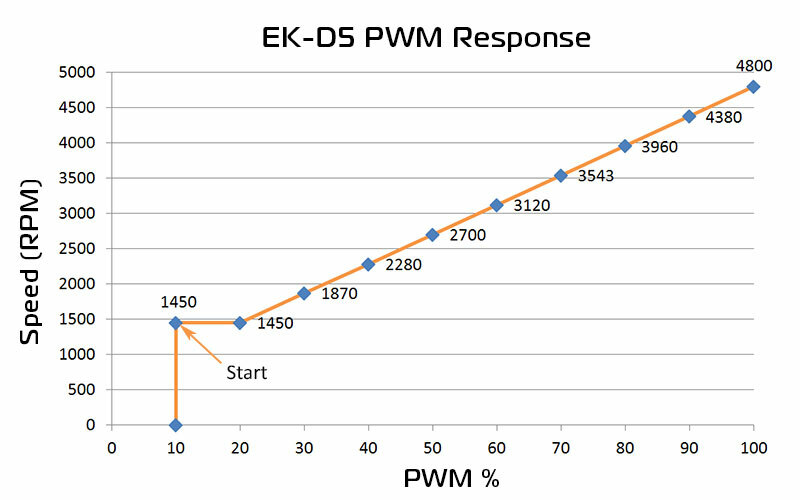 Do this for 20%, 40%, 60%, 80% and 100% Pulse Width Modulation modes, and you will have a plot of flow rate vs PWM that will help you interpolate the PWM required for a desired flow rate (e.g. 50% flow rate). Below is an example of Rotations Per Minute of a 12V computer CPU cooler water pump for a given PWM input. It is assumed that this would be under load (of pumping water), but not stated explicitly. Note that it may not be physically possible for the motor to operate with 10% or less PWM duty cycle. At this point I imagine that the internal friction of the motor and forces required to push the water along are greater than the force provided by a "10%" duty cycle. But how to set proper value on PWM pin so the flow equals to eg. 10%, 25% or 50%? We'll interpolate between the two table values that span the desired flow-rate. The idea is, if your desired flow is say, 17% (0.17) of the way between those two flows, you want a PWM value that's about 17% of the way between the two PWM values. Not the answer you're looking for? Browse other questions tagged pwm voltage or ask your own question.